Waters Design and Manufacturing provides our clients with custom metal products such as exhaust cabinets & booths, fume hoods, machine parts, and glove boxes, and stainless steel framework with finishes to your specifications. We have a complete fabrication facility which allows us to service the trade show arena as well as the medical equipment, retail, and industrial (OEM) industries. We offer the Very Best In custom high quality precision metal fabrication and Sheet Metal Assemblies For medical glove boxes and antechambers, industrial racks, hoods, and safety guards, and retail fixtures, desks, and counter displays. 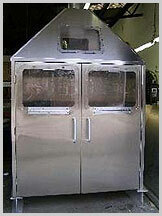 At Waters Design and Manufacturing; it is all about QUALITY, EXPERIENCE (Thirty years) , & DESIGN. From a simple cover or bracket to a complex sheet metal enclosure, we take pride in being responsive and efficient in providing the finest quality custom precision sheet metal fabrication products for your needs. Our efficiency comes through in our ability to perform not only as a high-quality supplier of precision sheet metal fabrications, but as a high-quality JIT precision sheet metal fabrication supplier. From print to prototype and production, you can expect to get a quality product in a timely fashion. Fast growing industries and companies require rapid responses from its sheet metal enclosure and sheet metal component supply base. Our informed and experienced personnel provide full estimating and "design for manufacturing" support service. With more than 30 years in the Custom Precision Sheet Metal Fabrication arena, our quality management system and our constant repeat work for our customers speak for themselves. We are dedicated to providing you with the highest quality products at a very competitive price. For production runs both large and small as well as prototypes in steel, stainless steel, aluminum, cold and hot rolled steel, and copper sheet at competitive prices, you cannot find a better source than Waters Design and Manufacturing. such as exhaust cabinets and booths, fume hoods, machine parts, glove boxes, and stainless steel framework with finishes to custom specifications.